Yongnuo is one of the established names when it comes to value for money DSLR accessories and lenses. It’s line up of inexpensive Flash and Lenses are highly reviewed and is recommended for hobbyists and professionals alike. Few months ago, Yongnuo entered the DSLR lens market with introduction of it’s version of YN 50mm f/1.8 lens which was relatively cheaper than that of the Nikon 50mm f/1.8 and canon 50mm f/1.8 while maintaining competetive level in quality. Yongnuo YN 85mm f/1.8 announced for DSLR Camera. Fast forward to 2017 and Yongnuo has yet again taken the photographers by surprise by introducing 85mm f/1.8 lens for DSLR cameras. Here is the all new Yongnuo YN 85mm f/1.8 which is almost three times cheaper than the Nikon and Canon counterparts. As of now, only canon mount is available. Nikon mount will be made available soon. Looking at the price it seems a fantastic deal for anyone looking to get professional results with a 85mm prime lens while not breaking the bank. Here are the technical details and specifications of the Yongnuo YN 85mm f/1.8 Lens. YONGNUO 85mm f/1.8 maximum aperture is a standard & medium telephoto prime lens. It support auto focus (AF) and manual focus (MF) modes. Supports full-frame and APS-C format cameras. Focal length: 85mm; closest focusing distance: 0.85m. Yongnuo announced about the new YN 85mm f/1.8 lens on their facebook page. We will update with the sample photographs from YN 85mm f/1.8 lens. Stay tuned. Hopefully we get to see the Nikon version soon. Looking at the price, it appears to be a bargain. It was initially listed for only USD 177 but it went back ordered and the current listed price is around USD 220. 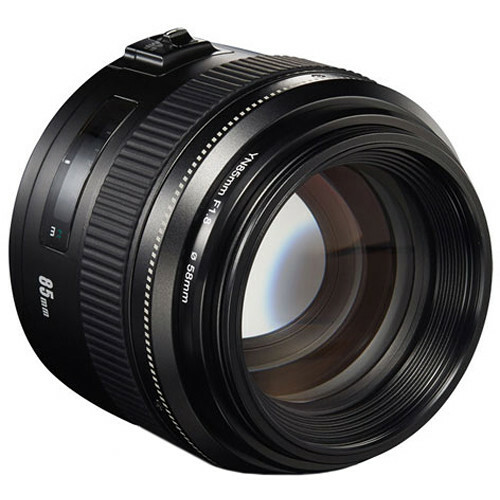 Check out the latest price of YONGNUO YN 85mm f/1.8 here.